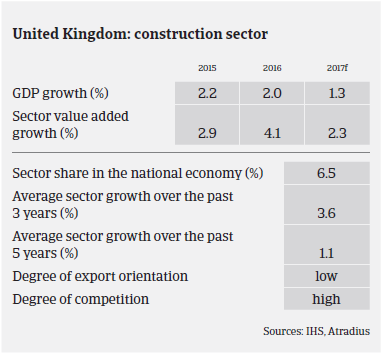 Uncertainty in the British construction market is expected to increase in the coming years, especially as a ‘hard Brexit’ seems to be most probable. After a weak performance in Q3 of 2016 (the first three months following the Brexit vote), the British construction sector recorded a rebound in Q4, mainly driven by residential construction. That said, commercial construction activity remained affected by subdued investment spending and heightened economic uncertainty. Skills shortages remain an issue within the industry, particularly in the London building market. This has caused cost pressure and has subsequently dampened the impact of improved tender margins. Legacy contracts have also caused issues, as during the downturn construction companies took on contracts at conditions that were no longer sustainable after 2014, mainly due to raw material price increases and higher labour costs. As many construction businesses have worked on such low margin legacy contracts, losses on contracts have been relatively frequent until recently, despite improving order books. However, it seems that this effect has started to abate towards the end of 2016, as many of those projects have been completed and tender margins for new projects have improved. Despite increased demand since 2014, contract issues and underperformance remain constant problems in the construction industry, as many businesses have been tempted by larger contracts with attractive margins. 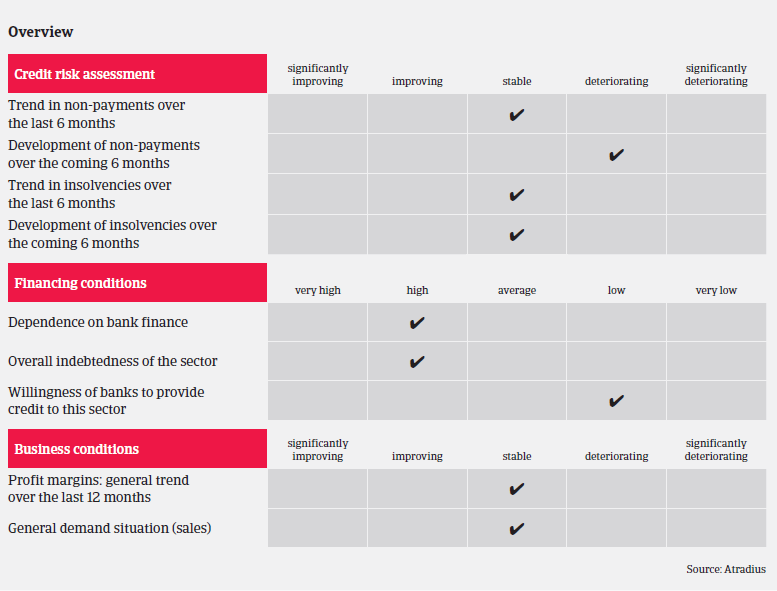 At the same time, access to bank finance remains difficult, especially for many smaller construction businesses. For growing businesses with light balance sheets, the risk of those contracts becoming unsustainable intensifies - especially if there are not sufficient reserves available to fund payment delays associated with disputes or contract delays. This has led to several insolvencies in 2015 and 2016, often of businesses experiencing high levels of growth and appearing to perform reasonably well at first sight. While no major increase in business failures is expected in 2017, the level of insolvencies in the construction sector will remain high. The same accounts for protracted payments and the level of non-payment notifications, which are expected to increase in H1 of 2017. 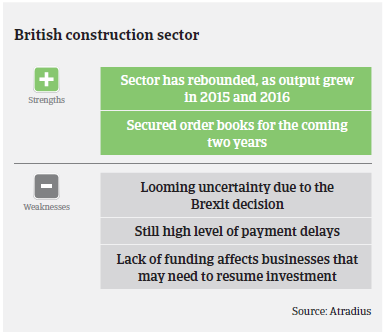 So far, the implications of the June 2016 Brexit decision on the British construction sector have been limited. Cost pressures have increased due to the depreciation of the British pound, as suppliers passed on higher costs of imported raw materials, and uncertainty remains in the market. However, many contractors still have 1-2 years of secured order books prior to the Brexit decision (particularly in the London market), which serve as a short-term buffer. Additionally, there are major public infrastructure schemes in the pipeline, such as HS2 (a high speed rail network connecting the North and South of England), Hinkley Point (a nuclear power station) and Crossrail 2 (a railway serving London and the wider South East). That said, it seems quite probable that in the medium- to long-term the Brexit decision will adversely impact construction, i.e. slower GDP growth and lower consumer, business and investor confidence will most probably put downward pressure on building performance. Uncertainty in the market is expected to grow in the coming years, especially as a ‘hard Brexit’ seems to be a possibility. After increasing our risk appetite in 2014, our underwriting stance has again become more restrictive since early 2015, when construction business failures started to increase again. For the time being, we continue to underwrite cautiously, with risks considered on a case-by-case basis. With legacy issues having been an issue for a number of years, and some seemingly healthy construction businesses rapidly deteriorating due to contract issues and underperformance, there is a need to receive the most updated management accounts from buyers. Close contact to buyers and regular provision of management accounts enables us to make a more informed decision on credit limit applications and ensures that decisions are as current as possible. While Brexit will undoubtedly have an impact on the construction market, for the time being the extent of this impact is unclear. But it looks more and more likely that Article 50 will be invoked in March 2017 and that there will be a ‘hard Brexit’. Therefore, we will monitor things closely with a ‘business as usual’ approach, and adapt our underwriting stance as the situation progresses. Oil market finally approaching balance? The price of oil has stabilised, largely thanks to OPEC’s shift in policy. The market is expected to rebalance in 2018 driving up prices in the medium term. The short-term outlook remains benign, but the Brexit decision will surely have an impact on domestic car sales and British car exports in the mid-term.